And then we ate this....and it was good. Our boys just love tacos and we make them regularly, but we tend to make either fish or steak tacos. But the boys are both starting to enjoy pork, and that means we get to “graduate” to the best (IMHO) taco meat, Carnitas. 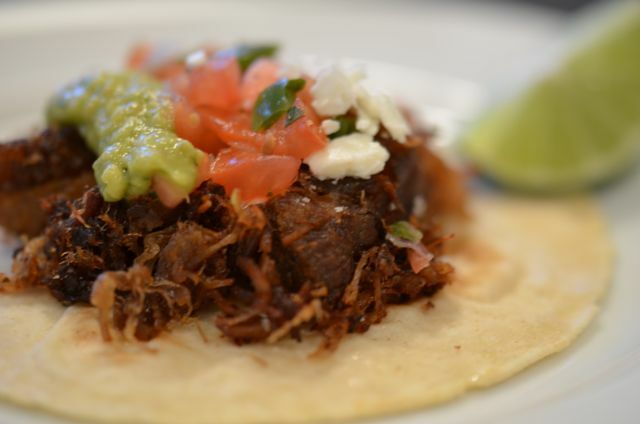 Carnitas are chunks of pork shoulder slowly simmered in their own fat. Crunchy on the outside, tender inside and joyously “porky”, Carnitas are perfect in tacos, burritos or on their own with a little rice. Traditionally, in the Michoacan region of Mexico, the pork is simmered in large copper pots full or pork fat. This is the best stuff. But we do not have the copper pot or that much pork fat (although our bacon fat supply is growing). Happily there is another method for making Carnitas that works just as well, and without the copious amounts of fat. 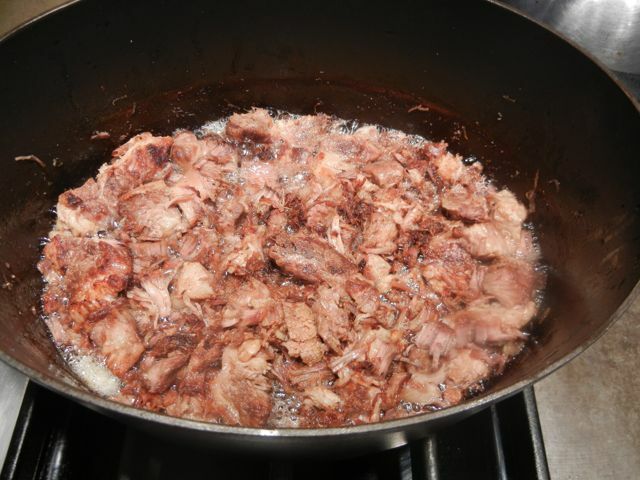 This method involves first simmering chunks of pork shoulder in water and then rendering out the pork fat. As the water evaporates, the pork starts to cook and get crispy in its own fat. This is a very easy way to make a super-tasty, flavorful dish. The only real requirement is time (about 3 hours) and some attention. As for ingredients, some recipes suggest just pork and water. Some other recipes include salt and still others either orange or lime juice. Having made many a low and slow pork recipe, we used salt and a touch of both the orange and lime juice to add color and a little flavor to the dish. But these are optional ingredients, really all you need is pork, water and salt. As for the pork shoulder, all you need to do is cut it into 1×3 inch pieces. And DON’T trim off any fat, you need it. 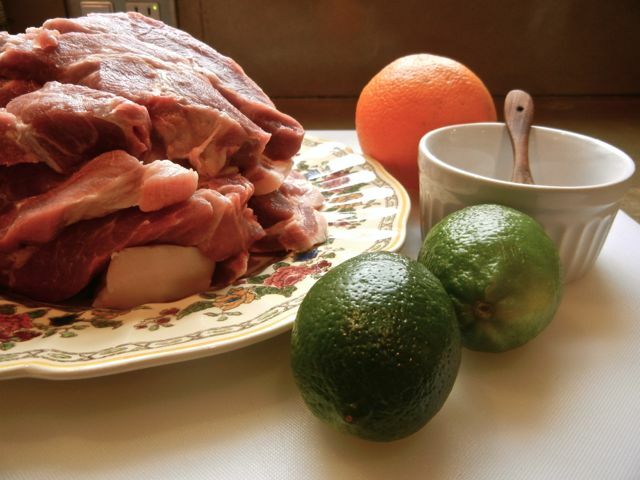 Place the pork in the pot, cover with water, add salt and squeeze in the juice of one orange and one lime. Bring the pot to a boil, uncovered, and then lower to a simmer for 2 hours. You just leave the meat alone. After the pork simmers for two hours, you turn up the heat to medium-high and bring the liquid to a boil. Let the pot boil for 40-45 minutes or until the water evaporates and is replaced by fat. At this point you can stir occasionally to keep the pork from sticking to the pan. Now just cook the pork until it is browned. We let this stage go until the pork gets very crunchy, and we can scrape the crispy bits off the bottom of the pan. But that is our preference, if you like bigger chunks or pork, have a lighter touch when stirring and pull the pork from the heat a few minutes sooner. 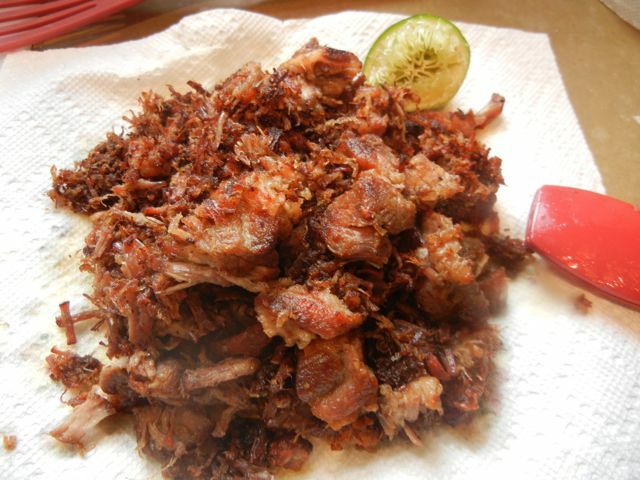 Then remove the carnitas onto a plate lined with a paper towel and you are ready to serve. As for the tacos, I went to our local Latin market and got some Masa for corn tortillas. The boys usually prefer flour tortillas, but I knew they would like the corn tortillas if we made them on-site. We have a tortilla press/cooker, and we do not use it nearly enough, so the homemade Carnitas were a good excuse to break it out. We like to add some cotija cheese, avocado, shredded cabbage and lime to our tacos, but diced onion, cilantro and salsa fresca are other standard condiments. We also like to add a slice of mango, when in season, to add some sweetness to the salty crunchy Carnitas. So the next time you are having some friends on the weekend, pull this dish out and make some real tacos. Maybe serve a few Margs or an Ernesto. You, and your guests, will not be disappointed. Make sure to keep the fat on the pork shoulder, you need this to render during cooking. Ask your butcher not to trim the fat off. What You Get: Super crunchy and tasty pork tacos. Just like a taqueria. Impressed friends. Happy kids. What You Need: No special equipment required. Just a heavy pot. How Long? 3 -3.5 hours. Less than 20 minutes of active time. This is a weekend dish, but one you can make while having a drink. Relax, enjoy. Cut the pork into 1 x 3 inch strips. 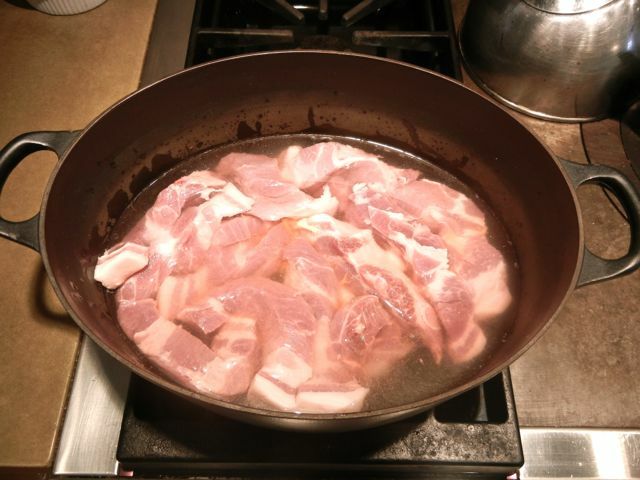 Place pork in a large heavy pot or Dutch Oven. Cover with the water, add salt, orange and lime juice. Bring pot to a boil and then lower to a simmer. Simmer pork, uncovered, for 2 hours. Do not stir. (But you can gently skim any foam or scum in the first 15 minutes or so of cooking, if you like). After 2 hours, increase the heat to medium-high and bring the pot to a rolling boil. Stir occasionally. The water will evaporate and be replaced by fat, this usually takes about 40-45 minutes. Allow the pork to be thoroughly browned in the fat, about 5-10 minutes, and then remove from the heat. Scrape any crunchy bits from the pan with a wooden spoon. Sprinkle with salt and lime juice before serving if you like. Serve as a main course or in tacos.